The kitchen presents special challenges when it comes to keeping your home organized and clutter free. Kitchens are one of the most heavily utilized spaces in your home, and they are full of an array of jars, cans, boxes, electronics, and so much more. Storage is key to ensuring your kitchen runs smoothly and effectively, allowing the beauty of your kitchen design to take center stage. 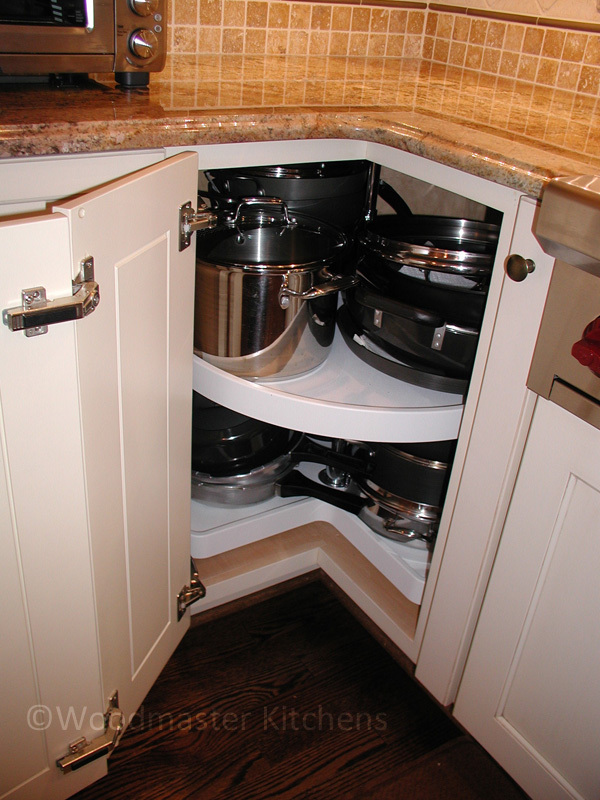 Thankfully there are clever, customized solutions to every storage requirement in your kitchen renovation. No kitchen is complete without a wide selection of oils and spices. These small jars and bottles present a particular storage dilemma since they must be readily available near the cooking area on a day-to-day basis. 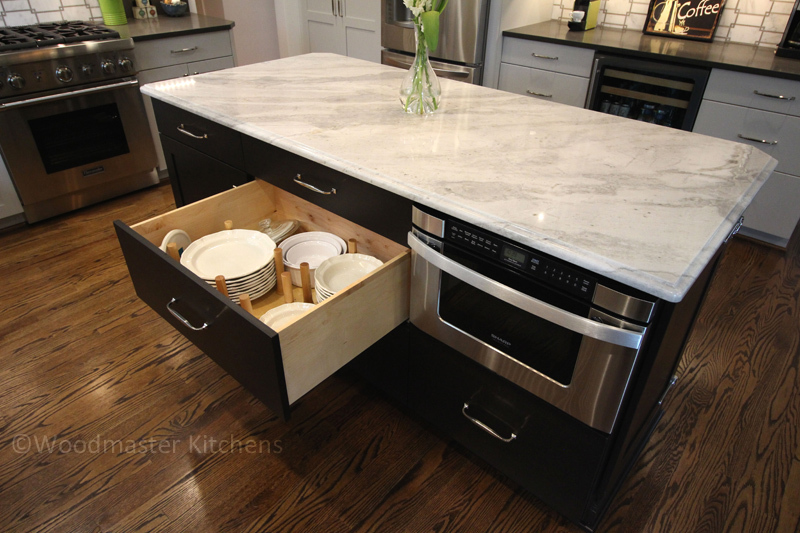 Instead of cluttering your countertop, include a drawer insert or custom pull outs like the ones below. The pull outs employee otherwise underutilized narrow spaces surrounding the cooking area. Cutting boards and baking trays can be unwieldy when stored on a standard kitchen cabinet shelf, as they do not stack easily and are difficult to access. Turn them on their side in a series of tray dividers and they become much better organized, visible, and readily available. Better yet, install a Galley Workstation that allows you to keep cutting boards available with its interchangeable dual-tier system, like the one shown here. A well-stocked kitchen requires a range of food items to be readily available. Keeping these items organized and visible also helps to manage your stock so that you do not buy items you already have. A pantry can be a walk in space lined with shelves and custom storage or a wall cabinet with pocket doors and pull out shelves like the one pictured here. Never go searching through a messy drawer again for silverware or cooking utensils. 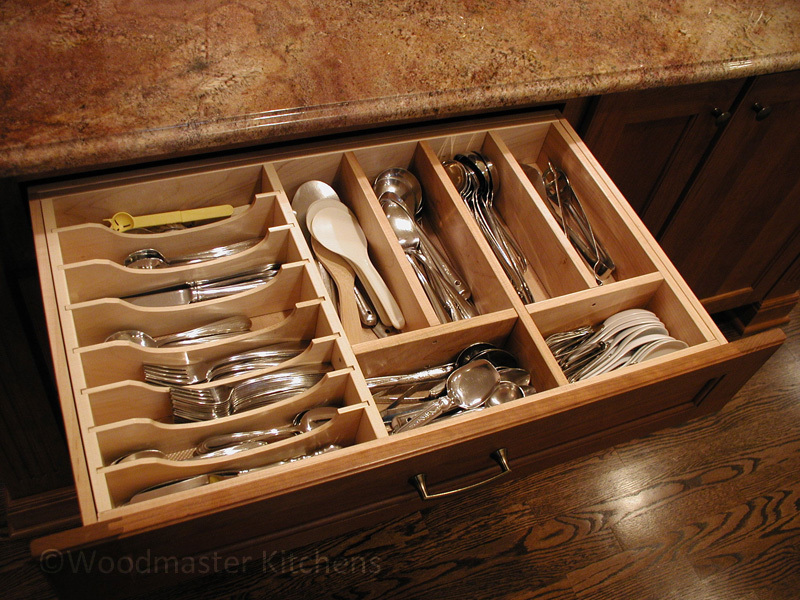 Inserts for drawers as shown below are the perfect way to keep all your forks, knives, and spoons organized. 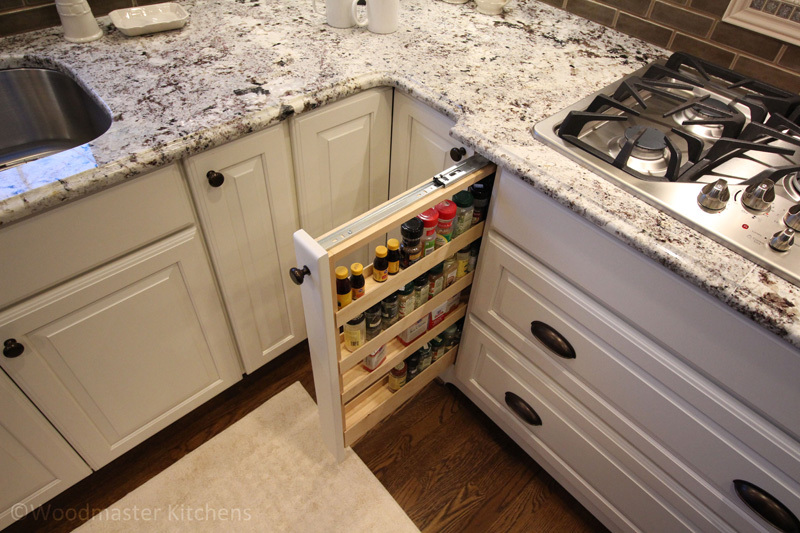 Similarly, drawers or pull out shelves with custom inserts can be ideal for cooking utensils. Kitchens serve multiple purposes beyond food preparation. Including a desk in the kitchen provides a designated area for work, homework, or planning the family’s weekly activities. A built in desk can be a fluid part of your style like this kitchen design in Ann Arbor, and also provide a place to charge and store electronics. A busy kitchen produces a lot of waste through food preparation, cooking, eating, and more. If you recycle then you may require more than one waste bin, and they must be readily available while not getting in the way. A pull out with built in bins is a handy way to make sure you can easily dispose of and sort kitchen waste while also ensuring it is concealed when not in use. Small appliances tend to eat up counter space, so designated storage ensures your counters are always free. An appliance garage like the one below left or a special pull out shelf like the stand mixer storage below right are just two of the clever ways appliances can be stored away but easily accessible. Every bit of space counts when planning kitchen storage, and the kitchen island offers valuable storage options. Beyond providing extra work space, islands can be the perfect place to store extra pots and pans or appliances. The end of islands can even be used for storing cookbooks or spices, or provide a space to keep pet food and bowls. One way to keep dishes well organized is by storing them in a drawer instead of a wall cabinet. Crockery drawers are an ideal way to keep dishes within reach, especially when combined with a peg system like the one pictured here. 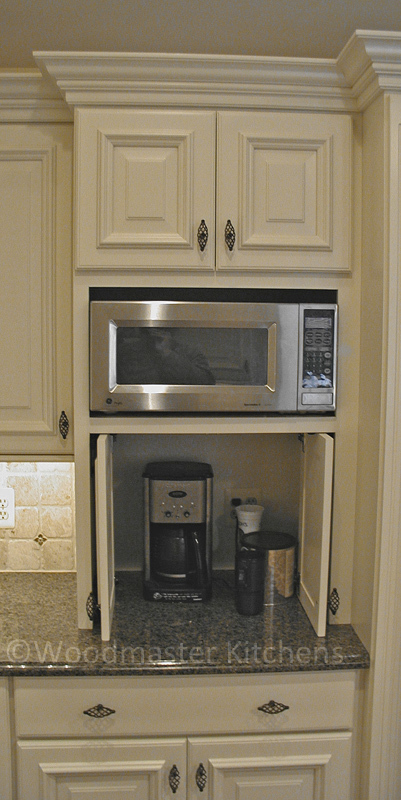 Corner cabinets can turn into an abyss, making them unsuitable to store and access anything. Reclaim this space by installing custom accessories like a rotating shelf or a “magic corner” pull out like those pictured below. Visit our kitchen design gallery for more great storage ideas. Better yet, contact us to find out how customized kitchen storage can change the way you use your kitchen.